I always love local detail in a window, particularly a picture of the building you are in. 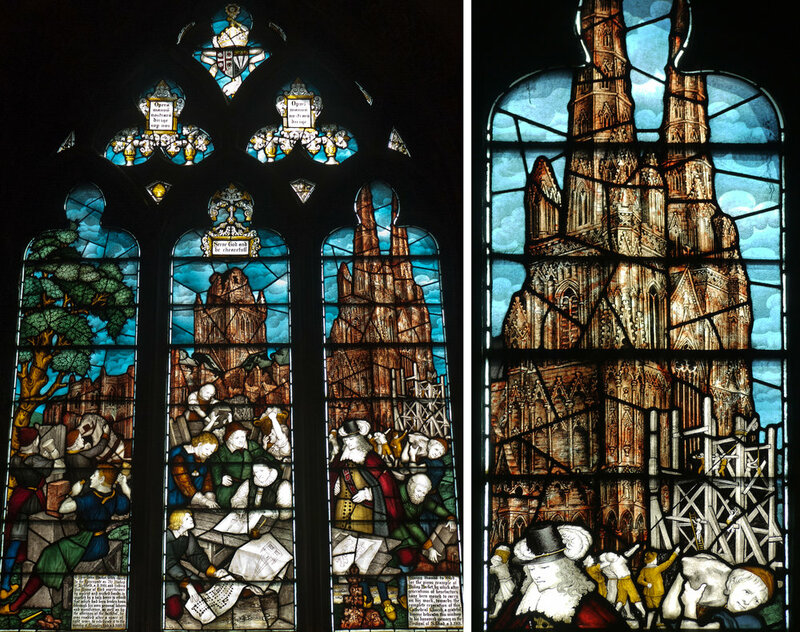 The window above shows Lichfield Cathedral undergoing restoration after the Civil War, Bishop Hacket is depicted in the central panel with plans of the cathedral. The colours and detail of the stone, set off by a gorgeous cloudy turquoise sky, add more local colour. 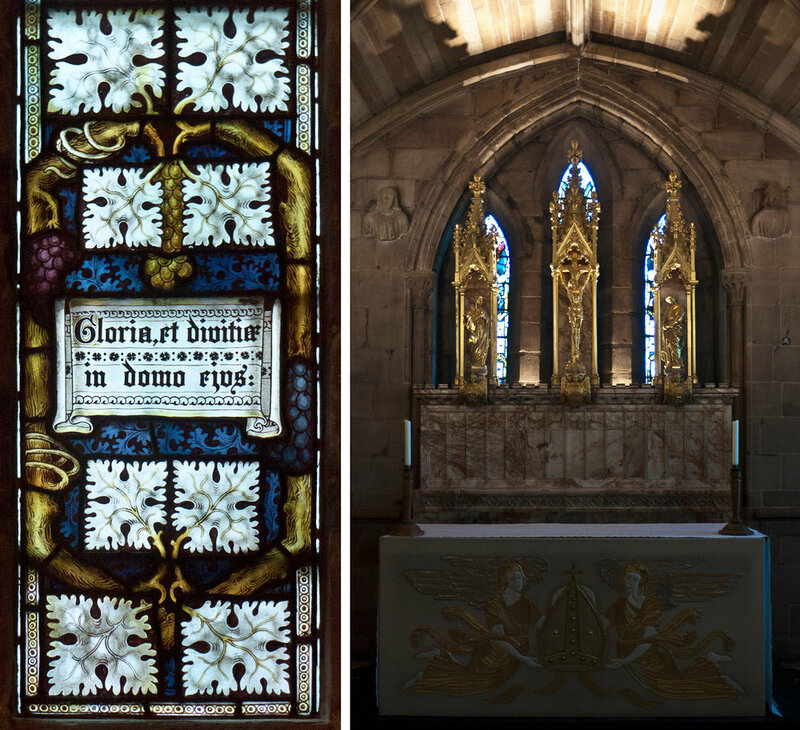 The Hacket Window is one of many works in the cathedral by Charles Eamer Kempe, these include sculpture, memorials, textiles and furnishings as well as stained glass. Further along the south aisle is a staircase with a small decorative window (below left) at its base, in a style that is even more recognisably Kempe's. Left: window on the staircase. Right: window inside St Chad's Head Chapel. 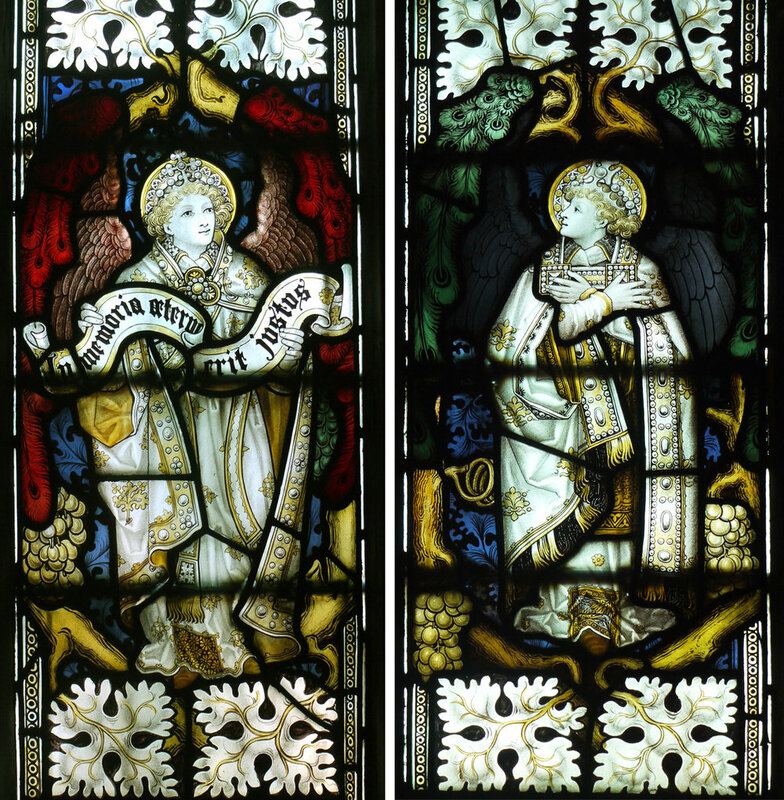 Below: details from central panel of this window. Climb the stairs and you are in a small chapel, St Chad's Head Chapel, where all the windows are designed by Kempe, with the same motif repeated throughout. I have seen this leaf motif of his before, I particularly admire the way that the undulating blades of each leaf form satisfying squares. It's not obvious what the leaf is supposed to be until you look at the detail in the other windows where the leaves are growing on a thick vine with bunches of grapes (that look like bubbles) crammed up against some typical little angels (example below). 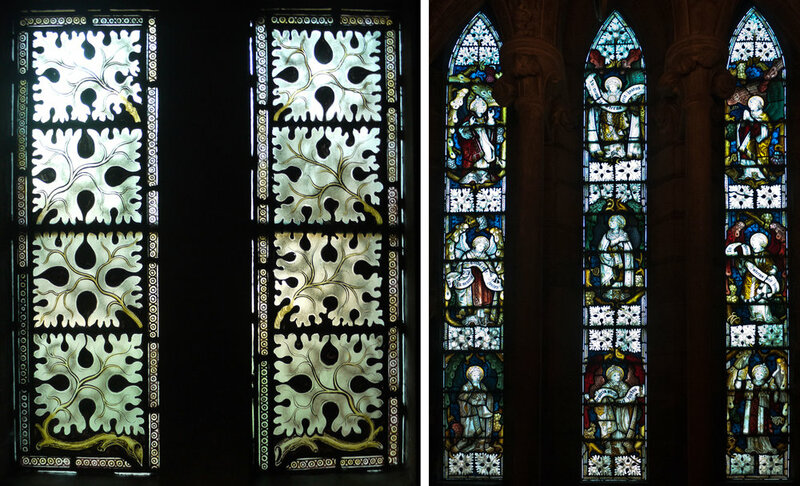 I particularly like the window opposite the altar (detail shown below left) which is composed of the leaf squares in two different sizes. The dark blue background is covered in a flowing version of the vine leaf motif, with bunches of grapes in shades of purple. The windows behind the altar (below right) have added and bigger angels, not that you can see them particularly well behind the reredos, also designed by Kempe, seemingly to hide them. However that photo shows the rich, dark atmosphere created inside this chapel, a former sacristy, by the combination of the warm stone, ancient carvings and a complete set of Kempe stained glass windows.